Eppa Sangria Organic Oasis: Summer of Sangria Tour! You are here: Home / Sponsored / Eppa Sangria Organic Oasis: Summer of Sangria Tour! 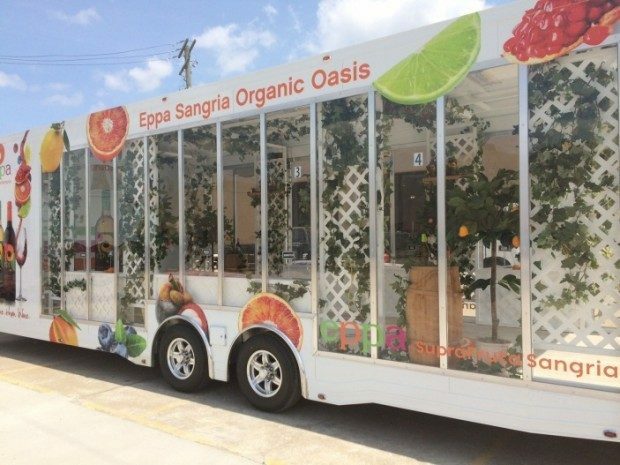 Eppa SupraFruta Sangria, America’s only sangria made with real, organic superfruit juice and organically-grown grapes, is launching its first national mobile tour. Traveling across the country, the Eppa Sangria Organic Oasis: Summer of Sangria Tour will visit a total of seven cities over two months. The tour kicked off in Los Angeles on June 2nd with Cheryl Burke, star of NBC’s new show “I Can Do That,” the truck will continue across the country stopping at regional summer festivals and hot spots to promote healthier lifestyle choices. This greenhouse on wheels is decorated with real superfruits found in the premium sangria. Wine lovers can stop by the truck and enjoy a FREE glass of Eppa, partake in mini yoga sessions from local instructors in the interior yoga studio, sample organic beauty products from Weleda and receive FREE massages. Visitors also have the chance to win athletic gear from Soybu with on-site raffles and social media giveaways. Below you’ll find a list of dates and locations for the tour. For additional information, please visit their website or Check out their Facebook page.